I have not found any records of baptism, marriage or death for my great-great-great-great-grandfather Filippo Coniglio, but I know his name from baptism, marriage, and death records of his wife and offspring. 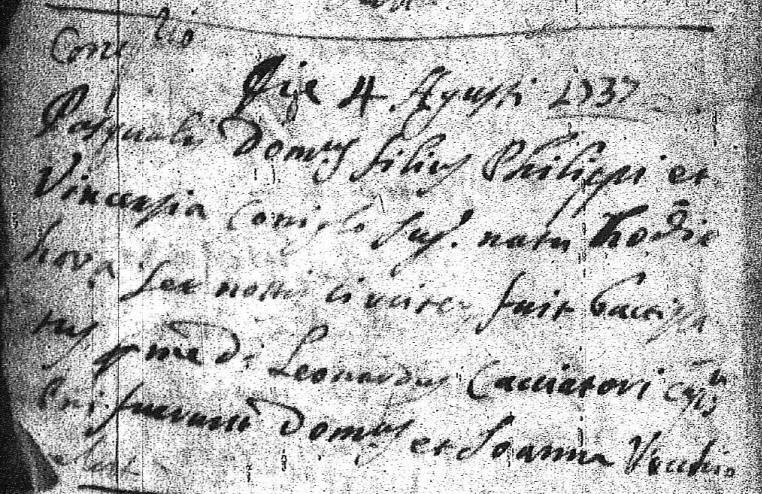 The 1737 baptism and 1759 marriage records of Pasquale Domenico Coniglio give his parent's names, in Latin, as Philippus (Filippo) Coniglio and Vincentia (Vincenza). Both parents were living in 1759 at the time of Pasquale's marriage, and in 1772 at the marriage of their daughter Giuseppa. The same names appear as parents on the 1740 baptism record of Gaspare Epifanio Coniglio and the 1828 death record of Concetta Coniglio. These early records don't give Vincenza's surname, but her surname is given as Ricotta on the 1821 death record of her son Amodeo Coniglio. Filippo was living at the time of his son Amodeo's marriage on 1 December 1775, and had passed away by the time of the death of his wife Vincenza Ricotta on 20 November 1800. PLEASE NOTE: The Coniglio family coat of arms shown at the upper right is that of a recorded noble Sicilian family. There is no documentation that Filippo was of that line. 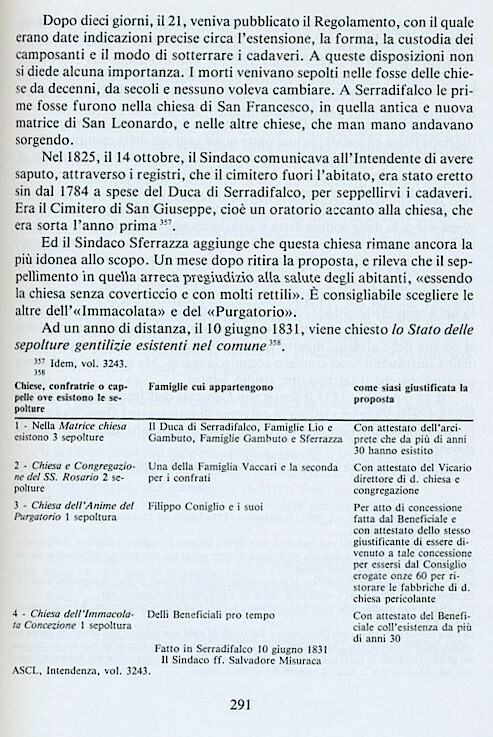 The book Serradifalco, by Giuseppe Testa, mentions that Filippo Coniglio was a benefactor of la Chiesa dell'Anime del Purgatorio (the Church of the Souls of Purgatory) and that he and his family were entombed there. Dopo dieci giorni, il 21, veniva pubblicato il Regolamento, con il quale erano date indicazioni precise circa l'estensione, la forma, la custodia dei camposanti e il modo di sotterrare i cadaveri. A queste disposizioni non si diede alcuna importanza. I morti venivano sepolti nelle fosse delle chies­e da decenni, da secoli e nessuno voleva cambiare. A Serradifalco le pri­me fosse furono nella chiesa di San Francesco, in quella antica e nuova matrice di San Leonardo, e nelle altre chiese, che man mano andavano sorgendo. Nel 1825, il 14 ottobre, il Sindaco comunicava all'Intendente di avere saputo, attraverso i registri, che ii cimitero fuori l'abitato, era stato eretto in dal 1784 a spese del Duca di Serradifalco, per seppellirvi i cadaveri. Era il Cimitero di San Giuseppe, cioè un oratorio accanto alla chiesa, che era sorta l'anno prima 357. Ed il Sindaco Sferrazza aggiunge che questa chiesa rimane ancora la piu idonea allo scope. Un mese dopo ritira la proposta, e rileva che il sep­pellimento in quella arreca pregiudizio alla salute degli abitanti, «essendo la chiesa senza coverticcio e con molti rettili». E consigliabile scegliere le altre dell' «Imrnacolata» e del «Purgatorio». Ad un anno di distanza, il 10 giugno 1831, viene chiesto lo Stato delle sepolture gentilizie esistenti nel commune. torare le fabbriche di d.
Ten days later, on the 21st, were published Regulations, with which they were given precise details about the size, the shape, and custody of the cemeteries and the way to bury the corpses. These provisions were not given any importance. The dead had been buried in mass graves of the churches for decades, for centuries; and no one wanted to change. At Serradifalco the first graves were in the church of San Francesco, in the old Mother Church and the new one of San Leonardo, and other churches, which gradually arose. It was the cemetery of St. Joseph, that is, a chapel next to the church, which had risen the previous year 357. And Mayor Sferrazza adds that this church is still the most suitable for the purpose. A month later he withdrew the proposal and notes that the burial in that church is detrimental to the health of the inhabitants, "the chapel being without cover, with many reptiles." It is advisable to choose the other churchyards of ''Immacolata" and "Purgatory." Later, on June 10, 1831, he prompted the report titled the state of noble burials in the existing town357. La Chiesa dell'Anime del Purgatorio is now known as la Chiesa della Modonna del Carmelo (the Church of Our Lady of Mount Carmel). It's located at Strada Umberto Secondo Number 1 in Serradifalco. My fifth cousin once removed, John Puma, lives in Serradifalco, and when at my request he asked about the church, he was told that the tombs were 'plastered over' and no longer viewable. On 2 June 2016, we visited Serradifalco, but unfortunately it was a national holiday, the church was closed, and I was not able to investigate further. Maybe next time. 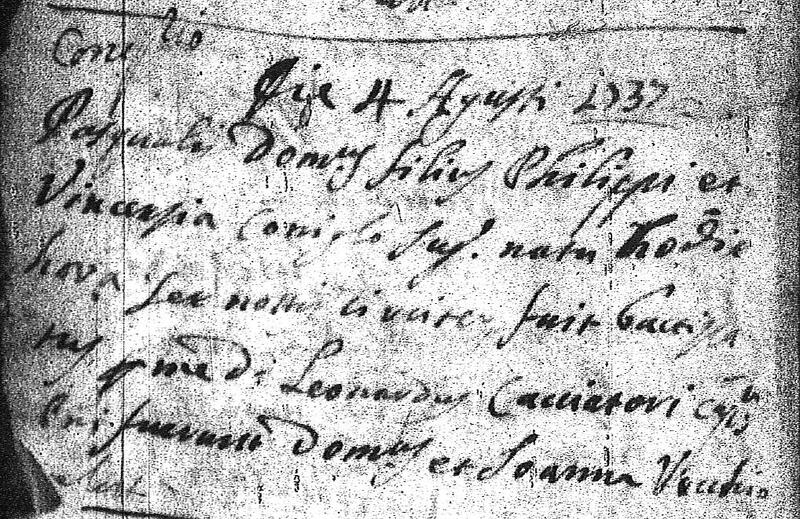 The baptism record of Filippo's son Pasquale is shown below. Filippo and Vincenza's grandson Raimondo Coniglio, born on 19 November 1764 to their son Don Pasquale Coniglio and his wife Donna Rosa Volpe, became a priest, benefactor and Chaplain of the same church, where he, too was buried.